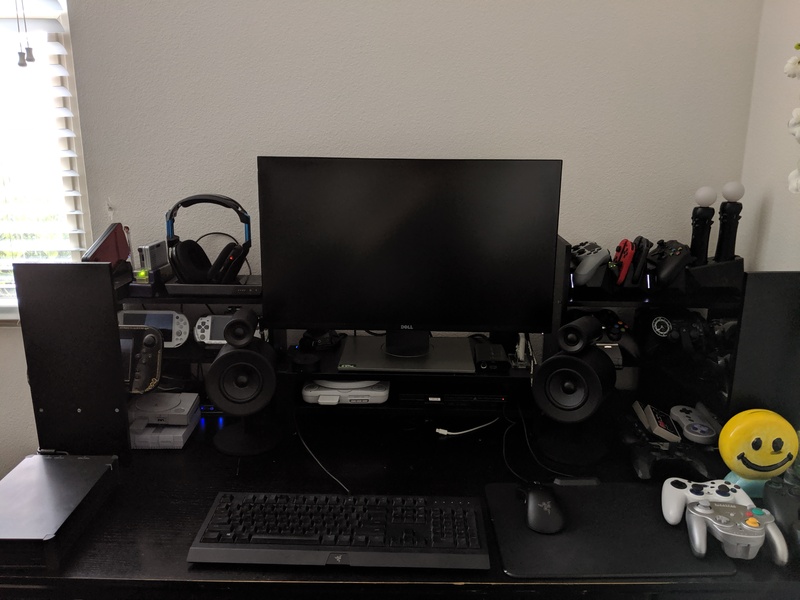 I store my handhelds and wireless controllers/chargers on my desk, not to mention the monitor, keyboard, and speakers for my desktop. My desk is getting pretty cramped. There's room for everything without crazy stacking, but it's getting to the point that it's hard to retrieve something without moving two other devices. It'd be really nice if I had something with more shelf levels so I could spread self out a little bit more, but finding something that's free-standing that would fit on a desk has been tricky. I'm considering getting a set of drawers or a filing cabinet for _under_ the desk, but that's probably not great for devices that have cords. Seriously though, I don't like those h-shaped shelves, my wife uses a white one on her desk, they aren't very efficient in terms of space. Let's see what your desk looks like now. So you're using the monitor for the computer and console display? Monitor is for the desktop, the mini consoles, and for capture card passthrough. The PS2 Slim is actually hooked up to the PSOne's screen. Are those Razer speakers...with or without RGB? How are they? Anyway, yea, there is no need to cram all those systems you own on your desk top. Imagine how clutter free and clean your desk will look if you just hook up ONE system and switch them when you move on to another game/system. The speakers are fine. I haven't really gotten a chance to exercise them (see above: baby) but they sound pretty crisp. The RGB is unimpressive. Full stop. It's so faint, I barely notice it.